The life of a fashion outsider trying to get in is no easy feat. Last night was day 4 of my new life as a paparazzi fashion street blogger. I had waitressed all day so again I had to go to a night show. I really have no idea how to use my Nikon D90 at night…it takes 20 seconds to click a photo and they always come out blurry. 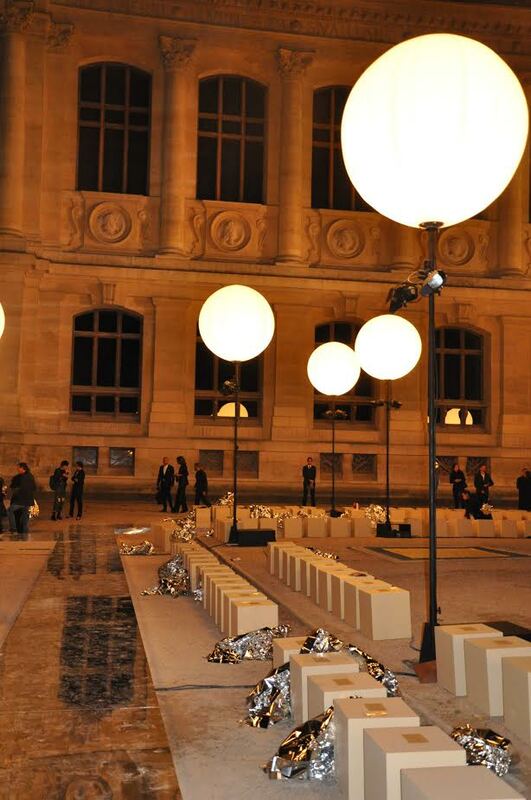 Also, I had no idea where the Givenchy show was being held. 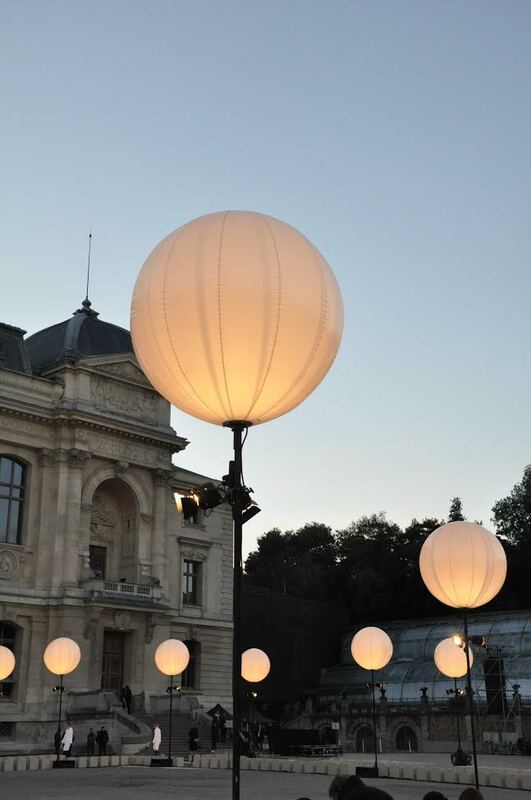 I usually go to Instagram and use #PFW to scroll the posts of those fashion insiders who take pictures of their invitations. It was getting late…7pm and still not one photo of an invitation. The show was scheduled for 8. 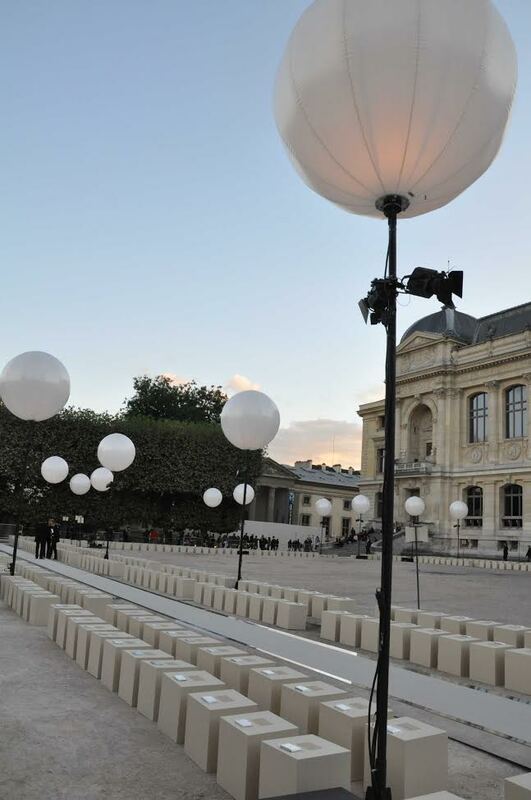 I finally reached out to a Givenchy fan site at 7:15 and asked if they knew the location…bingo bango…they sent me the address…and to my very good fortune it was in my arrondissement the 5th in my favourite place the Jardin des Plantes. Because I walk my kids through this park everyday to go to school, I knew which gate would be open. This allowed me to see the runway before the invitees arrived…as the sun was setting. Sooooo fun. I also got to see Courtney Love and Frances Bean arrive but my camera at this point gave up on me. A few models later and then Kardashian mom the show started. I had missed everything. So I decided to wait out the 20 minutes until everyone left….this time I parked myself at the side entrance. When the show was over the hustle to get out began. Gigi Hadid and boyfriend Zayn Malick led the pack and because the press swarmed them, security ran to help leaving the moment for me to slip in passed Vogue’s Hamish Bowles, who I may have pushed a little and who may have scowled at me (sorry Hamish please feel free to come and do a story on my home and garden one day). I was IN!!!!!! I got to see everyone up close and delight in the fashion, however, they were all so fast leaving that I didn’t get any photos….AGAIN. With almost everyone gone, I was able to walk the runway by myself and read the names on the seats. I wasn’t able to get backstage so I decided to wait under a lamp post until the models came out so I could get some shots of the makeup and hair. DONE. Then I saw Riccardo Tisci, designer extraordinaire of Givenchy, saying goodnight to some friends. I took my chance and walked up to him. He smiled and came right towards me. I asked for a photo and he said no problem with a huge smile. He was so lovely and warm. He said good night and off he went into the park on his own…no fuss. No entourage. So dear fashionistas, I don’t have many fashion shots from this show but I hope the insider look at the venue will suffice. But don’t dismay, Stella McCartney was this morning and in full daylight. I was able to at least capture this amazing coat and a side profile of model Natalia Vodianova. 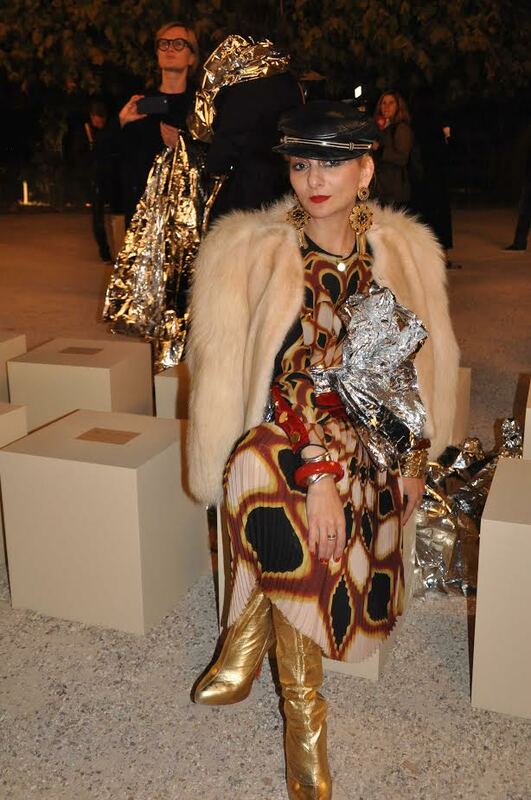 Before I left I was able to capture one of my favourite fashionistas Catherine Baba. 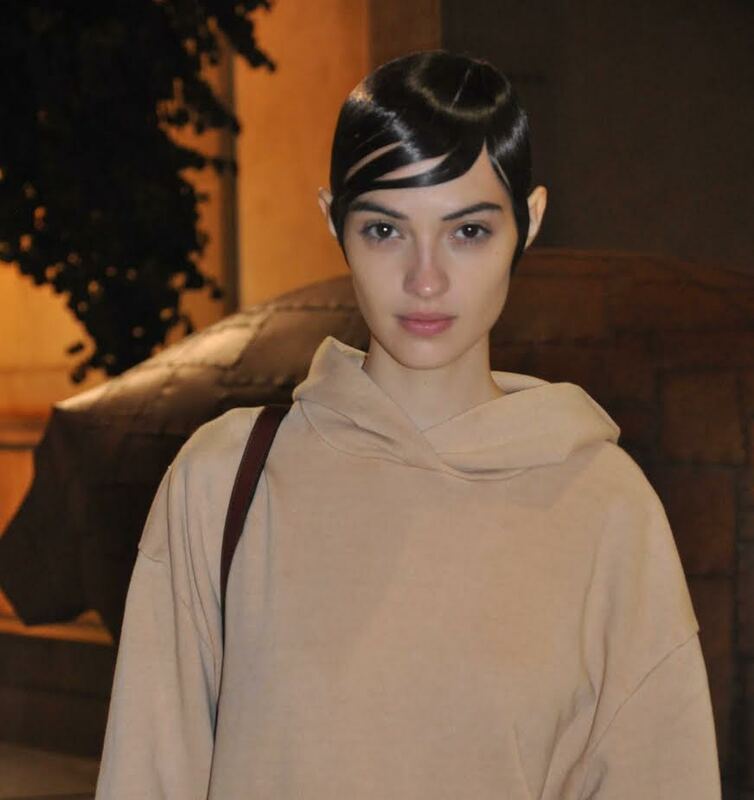 I was able to snap a pic of Riccardo’s muse Mariacarla Boscono after the show and another model for a close up of hair and make up. 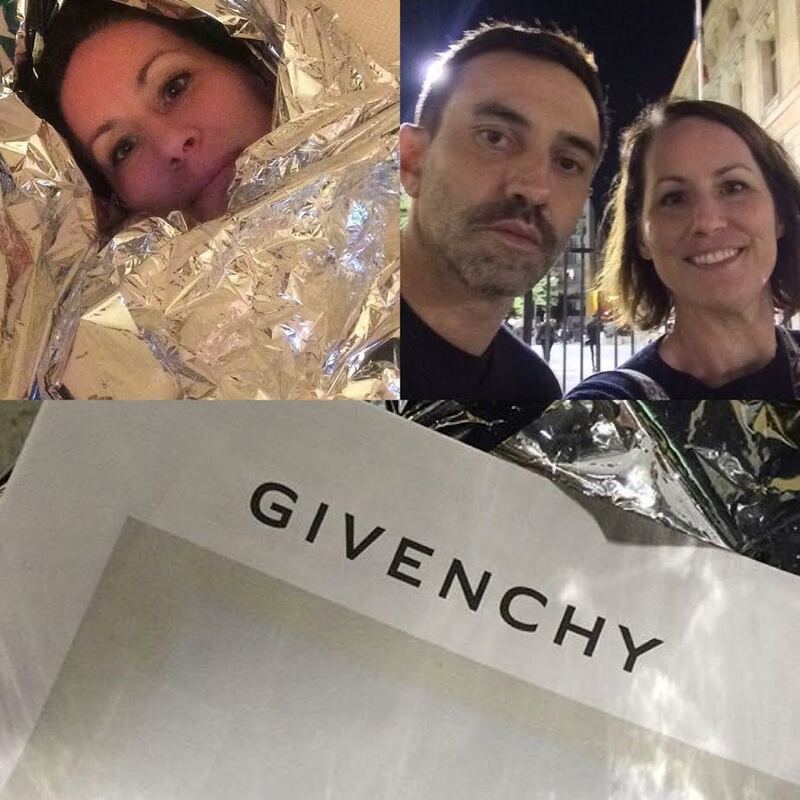 Suzanne with Riccardo Tisci, designer of Givenchy and in bed wrapped in her new Givenchy “sheets”. See her review at Dior, Isabel Marant,Rochas, and Paule Ka. All words & photos by Suzanne Bateman. You have arrived my dear ! Good job. Clearly you were meant to be there. Dude- This is UNREAL! You are my goddess And your photos are so so so good, they ooze of passion and giddiness z let’s embroider bomber jackets together and smoke again, k?